The Jumpstart Student Nutrition Program, that provides 3,606,369 meals for students in Windsor Essex schools, is benefiting from $78,491 raised through the “Pass The Puck For A Buck” campaign. The campaign is in association with the 2012 World Under-17 Hockey Challenge taking place at five local arenas from December 28th to January 4th. During the week of November 28th, students in the 83 participating schools donated at least a dollar to their school nutrition programs and passed around an official World Under-17 Hockey Challenge puck. Hockey fever hit the schools; many held special assemblies, had jersey days, hosted team challenges and much more. Money raised by each school was then matched by program sponsors Centreline (Windsor) Limited, Alpine Construction and The Windsor Spitfires Foundation. As well, the Jumpstart Student Nutrition Program also contributed money to bring the total amount raised to $78,491.00. All funds will be used to buy nutritious food items in each of the participating schools. Students and staff at every participating school received tickets to World Under-17 games, being played at the WFCU Centre, Tecumseh Arena, Vollmer Complex, UCCU Centre in Amherstburg and Essex Arena. Plus, three students from each of the top five fundraising schools per capita will drop the ceremonial puck before the games on December 28th. The top schools were Ecole Sainte-Therese, Century Secondary School, Princess Elizabeth Public School, Mill Street Public School and St. Bernard in Windsor. “The money is significant, especially now”, said Mary Lynn Biggley, Community Partnership Program Coordinator, Jumpstart Student Nutrition Program and Community Development Officer for the Greater Essex County District School Board. “What a privilege to hear the stories of school spirit, the excitement in the hallways, the laughter and team building” as students passed the puck around their school and competed in floor hockey games and shootouts to raise funds. The “Pass The Puck For A Buck” campaign was organized by Dan Laporte, Principal at St. James Catholic Elementary School in Windsor and member of the World Under-17 Host Committee. 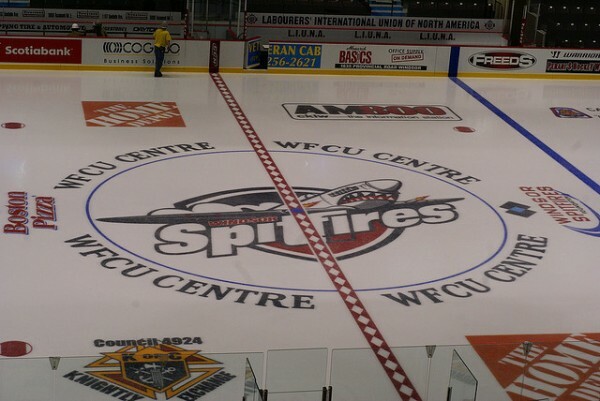 Partners included the Greater Essex County and Windsor-Essex Catholic District School Boards, The World Under-17 Host Committee and The Windsor Spitfires.